This is purely an artistic turning created from an English Yew log - which was destined for the firewood box - that I obtained from a neighbor's yard. Removal of this Yew tree was due to some yard modifications, as the tree overgrew its location planted nearly 50 years ago. In this country, it is rare to find English Yew logs of this diameter, and I'm honored to have given it a second life. When working with raw material such as this, it is nearly impossible to envision the final product. As with many of my recent creations (my children), this piece is moving up on my most favorite list. 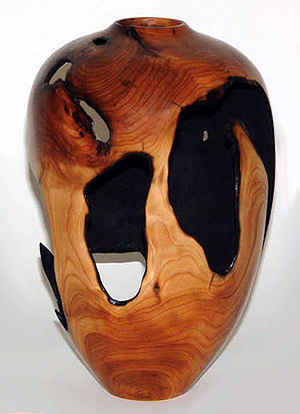 This hollow vessel was finished in early 2004, with the initial stages of turning starting six months earlier. During this time, it was a true "work-in-progress", with my starting and stopping on this turning sometimes weekly - debating what is the best method of tackling this piece - and knowing full well that cutting off even the smallest wrong amount could lead to its return to firewood. Bringing this turning to completion required me to reach deep into my bag of tricks - from turning it to a wall thickness that is less then 1/8 inch, to stabilizing it during the very delicate and exacting drying process, to the final stages of applying the final tung oil and carnauba wax finish. With proper care, this piece will last several lifetimes or more. As a part of my "Puka" Series - Puka [poo' kah], loosely translated from the Hawaiian language, means "holes" or "perforations" - this piece, with its natural cavities that I took advantage of by turning through the voids, is truly an unusual, distinctive, and "once-in-a-lifetime" creation. 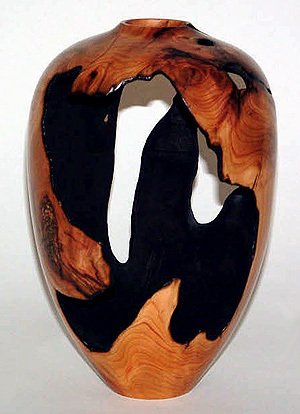 The interior of this vessel was dyed black, so that the viewer focuses on the exterior and the unusual colorations and grain patterns of this chatoyant wood that are brought to light by the turning process.